‘Y The Last Man’ Is Finally Heading to the Big Screen, And It Has Its Director!! 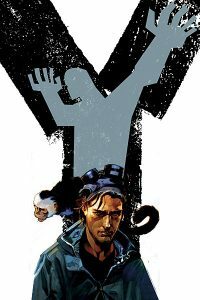 We have heard it all when it comes to ‘Y The Last Man‘, originally an epic and amazing comic book series from the talented Brian K. Vaughan and Pia Guerra, which began in 2002 under DC’s Vertigo label. We’ve heard it would be a film, a television series, and few other mediums. Nothing ever seemed to get off the ground. But finally, New Line Cinema is moving forward with a film based on the comic book. And, the studio has found their director, which is Dan Trachtenberg. That might not sound too familiar, but for you gamers out there, it is good news. Trachtenberg has done many commercials, but caught the public eye with his fan-made live-action short film/trailer based on the game ‘Portal‘. The youtube video hit the million view mark in under 24 hours and caught the eye of some big name talent in Hollywood. Personally, I think it’s great to go with a no-name to direct this, and judging by his ‘Portal‘ film, it could be amazing. Can’t wait for this and I hope this turns out right. Now we just need that ‘Preacher‘ project to get the green light and all will be well. Check out Trachtenberg’s short film below. This entry was posted on Wednesday, January 9th, 2013 at 9:43 pm	and is filed under Comics, Film, News. You can follow any responses to this entry through the RSS 2.0 feed. You can skip to the end and leave a response. Pinging is currently not allowed. « Check Out the Trailer for ‘The Last Exorcism 2’! !